This document will guide you through the necessary steps needed to install or update Android on your Gemini. Please note: Installing Android will delete any user data on the device. Please make sure you have a backup of any important data before starting! The first step to install FlashTool on a Windows PC is to install the flash tool drivers. The drivers are needed for your Windows PC to communicate with your Gemini, the minimum requirement is to have a 64bit Windows operating system. If you intend to install FlashTool on a Windows PC you can skip this section, otherwise please keep reading if you want to install FlashTool on a Linux PC. 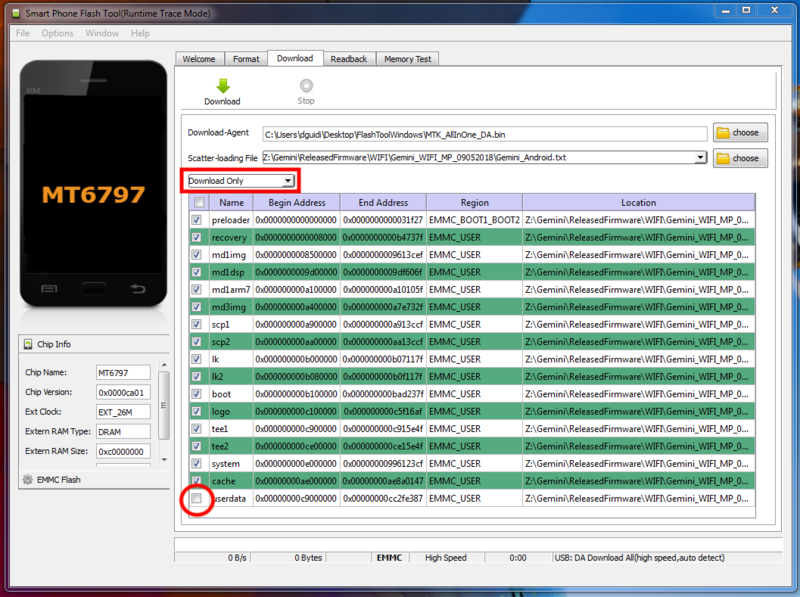 Now that the FlashTool application is running, it is time to download the Gemini Android Firmware from the Gemini Firmware page. After downloading the firmware, unzip it to reveal the folder containing the firmware folder, for example Gemini_WIFI_MP_09052018 or Gemini_x27_FOTA3_12062018. Downlad-Agent should be set to the file MTK_AllInOne_DA.bin, which is located in the FlashToolWindows or FlashToolLinux folder. Scatter-loading file should be set to the Gemini_Android.txt file, which is located inside the of the firmware folder that you downloaded. Next, just click the Read Back button, connect your Gemini to your PC and restart the Gemini. Once booting, the flash tool will detect the unit and will write the NVRAM partition on a file on your hard disk called NVRAM0 (see screenshot below). It’s a good idea to keep this file as a backup. If you want to flash the complete firmware to your unit then select Firmware Upgrade from the drop down menu.This will automatically select all the partitions in the table and it will restore your unit to its factory state. Please note that you will loose all your personal data/settings. To start the flashing process, just click the big Download button, connect your Gemini to your PC and restart the Gemini. Once booting, the flash tool will detect the unit and will start flashing the device with the selected firmware. This page has been accessed 26,533 times.